Every individual is at risk of developing chronic conditions leading to heart disease and cancer. South Asians develop heart disease on average 10 years earlier than other groups and have a much greater chance of having a heart attack before the age of 50. Learn more about your health and how to prevent long-term complications, access free downloads to help you get the most out of your doctors' visits, and watch online webinars here. New Diamond Jubilee Songs are now available! To celebrate Diamond Jubilee, and to express our sentiments at this joyous time, the Jamati Institutions are delighted to present all songs currently available on the Jubilee Songs Albums. These expressions of love and devotion have been prepared by our Jamat for the compilation of the Jubilee Songs albums. These songs reflect the Jamat's diversity of cultures, and unity in our affection for our Imam. Additional studio quality recordings of songs will be considered throughout the Diamond Jubilee year. Please e-mail JubileeInfo@usaji.org for more information. Please click here to enjoy these beautiful compositions. The Jamati Institutions are excited to launch the Ismaili USA mobile app for Apple and Android devices. 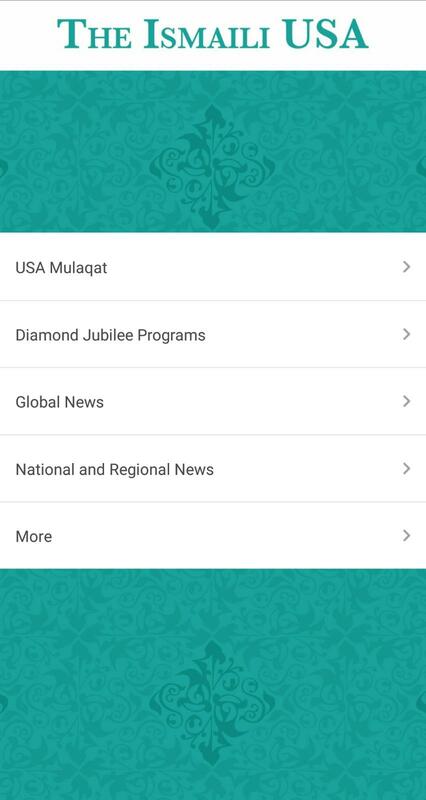 This informational app provides details on Diamond Jubilee initiatives, programs and activities, announcements, and news. Get up to date information on your regional events, and add them directly to your calendar. The app is available for download only in the United States. Journey for Health is a program that aims to improve the Jamat’s health, increase physical activity, and reduce the risk of heart disease and diabetes. In addition to capturing Jamati members’ progress towards better health, the Journey for Health portal will lead the Jamat on a virtual tour of 20 institutional and AKDN sites. Start the journey individually or as a team. To register, visit https://journeyforhealth.org, and use code WALKUSA (all caps, no spaces) as your Jamatkhana code. The link can be saved to start tracking steps or the minutes spent on favorite exercise. The Ismaili USA Magazine is Now Digital! The Council for USA is pleased to share with the Jamat that The Ismaili USA magazine is now available in digital format. Features of the digital magazine include interactive hyperlinks, video, and high resolution pictures. Click here to read the magazine. The Shia Ismaili Muslims are a community of ethnically and culturally diverse peoples living in over 25 countries around the world, united in their allegiance to His Highness Prince Karim Aga Khan (known to the Ismailis as Mawlana Hazar Imam), the 49th hereditary Imam (spiritual leader) and direct descendant of Prophet Muhammad (peace be upon him and his family). This is the official website of the Ismaili Muslim community in the United States of America.Please also visit our official Facebook page and Twitter handle. Registration process is now available for Diamond Jubilee Volunteers, FinOnline (jobs, business sales, etc. ), ITREB programs (Diamond Voyage, Diamond Journey, Waro audition, etc. ), along with Youth programs such as camps (Al-Ummah, Mosaic, Legacy, etc. ), i-Mentors, and Ismaili Student Network. If you are interested in these programs, please register for an account and complete all the steps outlined on the registration page. Please note that parents must register individuals under the age of 18. The registration process does require validation of your email address and completion of a detailed profile form so, we can authenticate your profile against existing system. If we are unable to, we will provide instructions on how to authenticate your profile. If you have any questions or need further information, please e-mail us at support@theismailiusa.org.